The unemployment rate, the number of employable but currently unemployed people seeking jobs, is a vital indicator of the health of a state's economy and the happiness and satisfaction of its citizens. 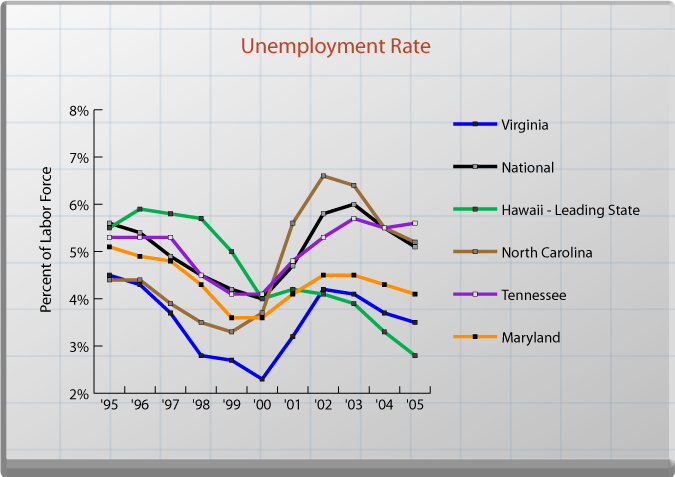 Virginia's unemployment rate is excellent — only two states, Hawaii and North Dakota — have lower rates. Unemployment is a measure of how many people who do not currently have jobs are actively seeking employment. Since employment is the way most people earn a living, unemployment is a measure of how the economy is doing in providing opportunities for Virginians to provide for themselves and their families. The inability to find work is also associated with psychological stress, health problems and stress on family relationships. The unemployment rate is a measure of the number of members of the labor force who do not currently have a job. A person is in the labor force if he or she has a job or is actively seeking employment. A person is not a member of the labor force if he or she does not currently have and is not seeking employment. Virginia had the second lowest unemployment rate in the country in 2005 at 3.5 percent. Only Hawaii (2.8 percent) did better. Virginia's 2005 rate was lower than its peers, North Carolina (5.2 percent), Tennessee (5.6 percent) and Maryland (4.1 percent), and lower than then national rate of 5.1 percent. Across the state, the unemployment rate varies from a high of 6.6 percent in the Southside to a low of 2.5 percent in the Northern Region. The central tier of the state has rates between 3.1 percent and 3.6 percent, while the southern tier and Hampton Roads register between 4 percent and 4.8 percent. 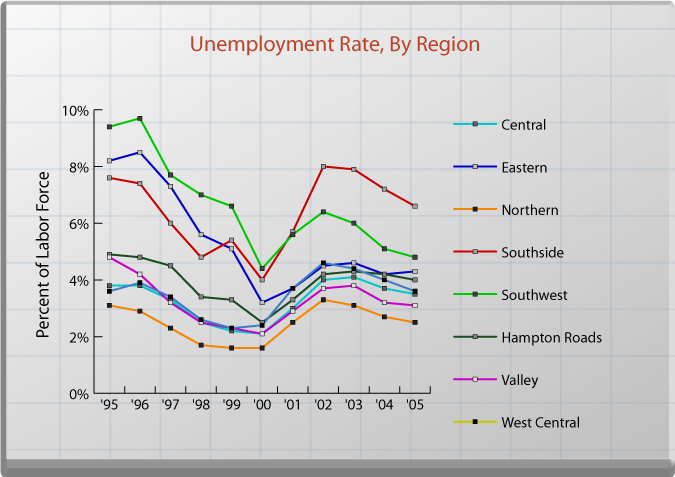 The Southside and Southwest regions have, in the last decade, routinely experienced high rates of unemployment relative to the other regions. In the short run, unemployment is largely driven by national macroeconomic factors. The jobless rate in Virginia moves with the national business cycle. However, in recent years, the influence of federal government spending has muted the response of Virginia's economy to reductions in the growth of the national economy. The large contribution of federal spending to Virginia's economy does carry a risk of lower growth in periods where the growth in federal spending slows. Among the longer run factors that affect the unemployment rate in Virginia are those that also affect Virginia's overall competitiveness: education, infrastructure investments, tax rates and the regulatory environment. Any changes that improve Virginia's attractiveness as a place to live or to do business will, over longer periods of time, tend to reduce the unemployment rate. State government has a number of programs that are, at least in part, designed to reduce the level of unemployment or to reduce its impact on people's lives. Most of the work of the Virginia Employment Commission (VEC) is directly related to addressing issues of unemployment. The Unemployment Insurance Program provides temporary financial support for workers losing their jobs. The VEC also has numerous programs designed to match unemployed workers with firms that have jobs to fill. The Virginia Workforce Network (VWN), which is the local service delivery system created by the federal Workforce Investment Act, is also a state response to unemployment. The community colleges have a role in retraining workers so that they can develop the skills they need to reenter the workforce. The Virginia Economic Development Partnership works to bring new employers into the state and to encourage existing employers to keep jobs here. The Virginia Initiative for Employment not Welfare (VIEW) helps Temporary Assistance to Needy Families (TANF) recipients prepare for and find jobs.